Once shunned for its thorny stems and lack of frost tolerance, Crown of Thorns is making a comeback. 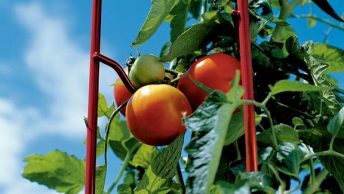 Selective breeding has introduced hybrids with new colors and fewer thorns, making this plant an inviting and intriguing addition to any garden. Given the right conditions, it can bloom all year long, and it tends to bloom more abundantly in the winter months. The blooms on the Crown of Thorns look like butterflies that have adorned the thorny plant with their graceful beauty, which is especially stunning in winter when not much else is blooming. Crown of Thorns is an easy plant to grow and often called indestructible because it can withstand long periods of dryness. Treated well, these plants can live for decades and have been known to be passed down in families through the generations. This is the perfect plant for the forgetful or neglectful plant-enthusiast. The Crown of Thorns is extremely forgiving and its care is simple. It is quite difficult to kill this plant. This hardiness also makes it an excellent choice for water-challenged areas of the country. It doesn’t use a lot of resources and allows you to grow a beautiful plant while also conserving water. Desert landscapes and natural garden designs using drought-tolerant plants benefit from including Crown of Thorns. Crown of Thorns (Euphorbia milii) originally came from Madagascar and there is speculation that this is the plant used to create Christ’s crown of thorns, hence its name. It may have been growing in the Middle East at the time of Christ, yet it is unlikely this is the one that was used for his crown. Some people arrange their Crown of Thorns branches in the shape of a crown to honor this legend. The Crown of Thorns plant is a sprawling shrubby succulent with many branches and 1″ spines covering the purplish-brown stems and branches. There are types available now that hardly have any thorny spines at all. The original varieties grew woody stems up to 3 feet tall. Some newer varieties can grow up to 5-6 feet tall. The stems are 5-6 sided and made to hold small amounts of water. The succulent leaves are oval, smooth-edged, narrow, and grow in a spiral fashion on the stem. Leaves can range from 1 ½” on the original plant up to 6″ on some of the hybrids. The leaves range in color from bright green to a grayish green. As the stem matures, the leaves drop off naturally. Under ideal conditions, the Crown of Thorns will bloom year-round. The tiny cup-shaped flowers are generally formed in clusters of two to eight at the tips of the stems. The flowers are enclosed by red bracts which are modified leaves that look like large flower petals. It is the bracts that give this plant its showy appeal. The original plants almost always had red or yellow bracts. Recent hybrids offer bract colors in yellow, red, shades of red, shades of pink, yellow, white, orange, blue, cream, and bi-color variations. When people refer to the color of their Crown of Thorns, they are usually talking about the color of the bracts, not the actual flowers. The flowers are minuscule compared to the bracts surrounding them. Bracts sizes vary among varieties and are usually classified as small, medium, or large. There is no uniformity as to what these sizes indicate so if you are looking for a particular size, be sure to see a picture of the plant first to get an idea. The rapid development of new cultivars in the last 30 years with little to no documentation or guidelines makes getting a specific type rather difficult. This ambiguity is also what makes growing this plant so much fun. Crown of Thorns stems contain a sticky milky sap that is poisonous if ingested. Skin irritation can also happen after touching the sap. It is recommended to wear gloves when handling or trimming these plants because of the sap and because of the thorns. Wash off any sap that gets on your hands or body. Be very careful not to rub your eyes or touch your mouth after working with this plant. The poisoning can range from minor irritation to nausea, vomiting, and diarrhea. 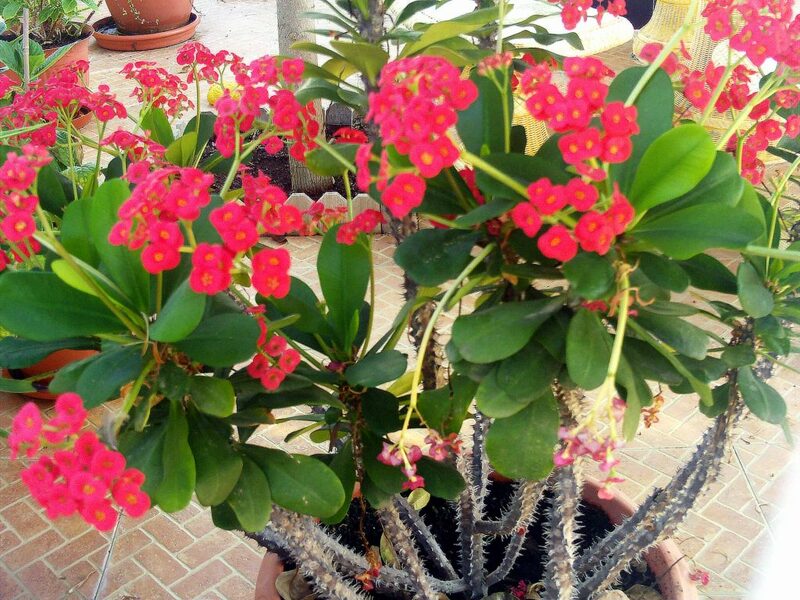 Euphorbia Milii – The original Crown of Thorns, this variety has lots of long thorns, brilliant red bracts, and grows in a sprawling, meandering, manner. It is not cold-tolerant at all and in cool climates, it should be kept as a potted plant and moved indoors and outdoors with the weather. Euphorbia Lophogona – One of the original varieties found in the wild, this type varies from milii because of its longer, leathery, leaves and its more upright growth. It doesn’t sprawl as much as the milii. The bracts on this variety are white, giving it the common name “White Crown of Thorns”. It also is not frost tolerant at all. California Hybrids (Euphorbia x lomi California Group) – These were bred to have shorter stems and larger, more colorful, bracts. They are also called the “Giant Crown of Thorns”. Varieties include Rosalie, Vulcanus, and Saturnus. These varieties are difficult to find on the market and may involve lots of inquiring to garden shops and long-time gardeners. German Hybrids (Euphorbia x lomi Heidelberg Group) – Propagated in Germany from species collected in the wilds of Madagascar, these have thinner stems and thicker leaves. Varieties include Somona and Gabriella. These varieties are hard to find in the United States. There is little standardization of colors or names with the Thai hybrids. They are often only listed by their color with no other information to distinguish them from others. When researching these to buy, descriptions alone will generally not suffice. It is best to see them in person or see a picture to understand the color and size. Even then, what you think you are getting may not be entirely true since some varieties have flowers that change color or varieties that sport several different colors that bloom at different times. Purchasing a Thai hybrid can bring a level of fun and intrigue to your garden that isn’t possible with many other plants. Thai hybrids that are named include Jingle Bells (pink with red and green hints), Spring Song (deep, rich, yellow with an emerald green spot in the center), New Year (goes from rich, smooth, yellow to bright cherry red), and Pink Christmas (starts off cream colored and then saturated with light pink and red). Some Crown of Thorns varieties are available as double-flowers, also called double-form. In these types, flower stamens are transformed into additional petals which make for larger, ornate, blooms. Without a stamen, pollen can’t be produced. This means the flower will sit in bloom longer as it waits for a pollination that will not occur. While long-lasting, large blooms are great for the beauty of the garden, it is not good for bees since the flower provides no food for them. Keep this in mind when choosing a Crown of Thorn’s variety. If the plant is kept indoors, whether it is beneficial to bees is less important. This succulent is a slow grower and propagates best from a cutting. If you order a plant start, most companies will ship dry root cuttings. New roots usually form in 14-21 days and will begin flowering immediately. It can take 12-35 weeks for the roots to establish themselves, depending on the size of the plant and the pot they are in. Smaller plantings take less time, of course. Place the new plant in a warm location, around 75F is good. In 2-3 weeks, the roots will form. To test the roots progress, tug very lightly at the cutting. If it offers resistance, then the roots are beginning to establish. V-cleft grafting works well with Crown of Thorns. There is less risk of root rot when using this method as opposed to cuttings. Grafting is generally a technique used by professionals and plant breeders since it does take some skill. To graft, the host plant is cut down so it is 2-3 inches above the soil. A V-shaped cleft is then cut into the revealed stem, ¾” deep. A 3″ stem cutting is taken from the propagating plant and a matching ¾” deep V-shape is cut into it. When the milky sap stops on both edges, the two pieces are fitted together and tied securely in place with grafting tape. Crown of Thorns can be planted from seed, however, it takes much longer and they are less likely to produce new seed unless they are hand-pollinated with other plants. Plant Crown of Thorns in full sun or partial shade. It will do well in both situations. Generally, this plant prefers full sun but some of the newer varieties do better with some shade. Shaded plants, however, may not produce as many flowers. Follow the planting tag for your particular Crown of Thorns. Since there are so many new hybrids available in recent years, it is difficult to say the exact needs of each plant. If you live in a desert climate, it will benefit the Crown of Thorns to have some shade during the day. If the Crown of Thorns is being planted outside, choose a location that doesn’t flood and has good drainage. It should also be a space that does not receive water from sprinklers. Wet leaves can encourage fungal growth. They do well and look great, planted among other succulents and plants that have similar requirements. 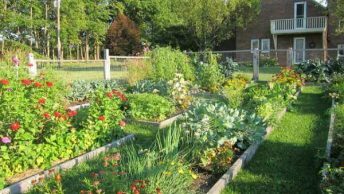 In the case that there is not a location with good drainage or full sun and you have the space to build, consider putting in a raised bed specifically for this type of plant. It should be 12-18 inches high and be filled with crushed rock and sandy soil. When planted with other plants, leave 2 feet of spacing around the Crown of Thorns since it is likely to sprawl out (depending on the variety) and can grow quite tall. Many Crown of Thorns plants will adapt to the planting container. They can be kept in small pots to keep their growth compact. Some newer varieties do need bigger pots so it is best to check the specific planting instructions before proceeding. Plants should only be re-potted if they outgrow the ones they are in. This generally takes about 2 years. Crown of Thorns need to be planted in rich, well-drained soil. Cactus planting mix with added perlite, pumice, sand or gravel, as well as some compost, is perfect. 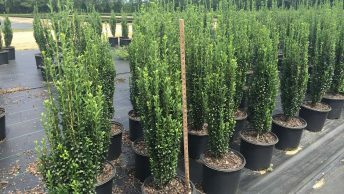 The thick stems and top-heavy growth can make these plants tip over in light soil. Adding sand or rocks to the bottom of the pot will increase stability. Crown of Thorn plants like hot, bright, conditions. They are highly heat-tolerant. 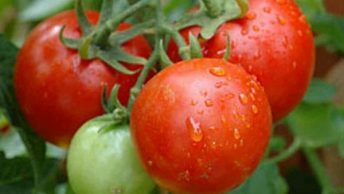 They are not frost-tolerant, however, newer varieties claim they can withstand temperatures down to 25F. They can handle cool nights as long as the daytime temperature is above 60F. In USDA hardiness zones 9 and above, Crown of Thorns can be a perennial. If you live in a colder climate, keep your Crown of Thorns plant in a pot and bring it inside during the winter. It will do well inside and needs to be on a sunny window ledge. If this plant is kept in cold temperatures for too long, it will drop its leaves. Temperatures need to be above 60F for Crown of Thorns to thrive. In cold temperatures, Crown of Thorns will go dormant and drop all their leaves. They can remain dormant for months as long as they stay dry. When moving Crown of Thorns between indoors and outdoors, make sure to do it slowly so it can acclimate. Improper acclimation leads to leaf drop. Humidity isn’t an issue for Crown of Thorns since it is originally a desert plant. This plant doesn’t require a lot of watering. It is a succulent with stems that are designed for holding small amounts of water. The soil surface should be visibly dry before being watered. Drench the soil thoroughly when watering until water dribbles out the bottom of the pot. The water should be soaked into the soil by about an inch. Drain off any water that ends up in the pan underneath the pot. Leaving standing water and over-watering can lead to leaf-drop and root-rot. Ensure that there is good drainage so the water doesn’t build up and cause problems. The exact watering schedule will depend on where your plant is located and the climate. 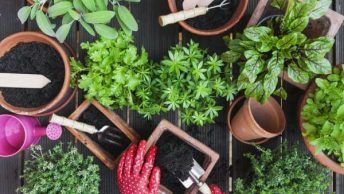 Watering approximately once every 2 weeks is a good guide to start and then you can adjust it to your situation and your particular plants’ needs. Crown of Thorns like full sun and can also tolerate partial shade. In USDA planting zones 9 and higher, they can be kept outside year-round. In cooler climates, keep the plant outside during warm and hot months and then bring it inside when it gets cold. A spot on a south-facing window ledge is perfect for cold months. Full sun is needed for the plants to flower, however, they do need periods of darkness to initiate the flowering. Nighttime darkness is enough for initiating the flowering. Do not keep the plants in a place where they get light 24/7. For better blooms, the addition of fertilizer in the spring and fall is beneficial. Applying fertilizer more will often encourage bigger displays, however, twice a year is also sufficient. Too much fertilizer can cause the plant not to flower at all. When the flowering cycle is complete, the plant can be trimmed to maintain size. Thin and weak branches can be removed to increase vitality. Remember to wear gloves to avoid the sticky white sap and the thorns. The stickiness of the sap can cause cutting tools to gum up so it is recommended to use a single-blade knife for any trimming. Remove any dead or dying leaves and flowers to prevent the growth of fungus. Any part of the plant that turns brown should be removed. Since this is a slow-growing plant, it may be that you don’t need to really prune until the 3rd or 4th year. To lessen the risk of stem disease, prune during dry, cool temperatures. 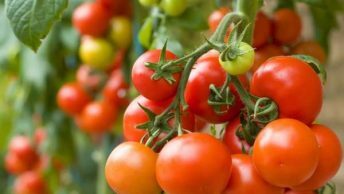 The base of compact varieties should be thinned to improve air circulation. There aren’t many pests or diseases that severely affect Crown of Thorns. This hardiness is one of the benefits to growing it. The majority of issues people have with growing this plant comes from over-watering which in turn causes root-rot. Mealybugs – These bugs are soft, wingless insects that feed on the sap of a plant. They appear as white cotton-like masses on the stems and leaves. Mealybugs will cause the plant to weaken and leaves will turn yellow and curl. Infected leaves should be removed or insects dabbed lightly with a cotton swab dipped in rubbing alcohol. Spider Mites – These little bugs operate in large numbers sucking the sap out of plants. They are reddish brown or pale and are so tiny they are hard to see. Evidence of their presence is found in the small dots they leave all over the foliage, yellow leaves, and possible leaf drop. Do not use chemical solutions to get rid of these. Chemicals kill the mites natural predators and help the mites thrive even more. Washing the leaves will get rid of them as well as removing the leaves entirely. Root Rot – The cause of this is simple. Plants are over-watered and don’t have sufficient drainage. The roots sit in wet soil for too long and then rot. To prevent this, make sure any pots used have good drainage and don’t water until the soil is dry to the touch. Cold damage – Stems become soft while leaves look burnt. Remove them as soon as they are discovered to prevent the spread. Leaf Drop – This occurs when plants are moved too quickly from one temperature to another, usually when they are being moved outside from being indoors all winter. To prevent this, acclimate them slowly to the brightness of the outdoors. Leaf drop in these situations is generally temporary and they will recover. Other environmental stresses can also cause leaf drop. If this happens with your plant, it is not happy about its current conditions. A small amount of leaf drop is normal. This is especially common on the lower branches of the plant. Leaves will turn yellow and drop away while the leaves on the top of the plant stay green and healthy. There is nothing to worry about if this happens, as long as the rest of the plant looks healthy. The time to be concerned is when the plant loses all its leaves. Crown of Thorns is a stunning, easy-to-grow, succulent that grows well indoors and outdoors. The colorful year-round blooms make it an attractive addition to an inside windowsill or arranged with other succulents outside. With all the new varieties and hybrids making their way into the market in recent years, there is so much to choose from as far as color, size, and arrangement. A collection of Crown of Thorns will add distinction and beauty to any garden. Foliage Rambling, sprawling, branches with thorny, woody stems, and green, rounded leaves. Flowers Tiny flowers surrounded by larger brightly colored bracts.